Time to travel once again to distant locations, but in Lost Cities: Rivals you might find yourself running short of cash to take the trips you want! 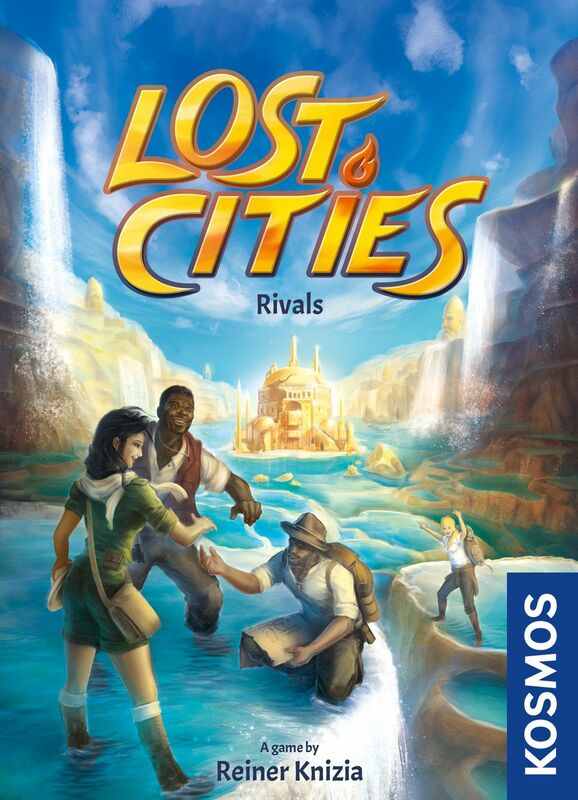 Lost Cities: Rivals features gameplay familiar from other titles in the Lost Cities series. Players will collect colored expedition cards and place them in ascending order in personal expeditions, possibly placing wager cards before beginning an expedition in order to increase its value. The primary difference in this title compared to others is that you must win auctions in order to place cards in your expeditions. The card deck consists of (in each of the five colors) three wager cards, two copies of cards numbered 2-5, and one copy of cards numbered 6-10; shuffle this deck, then divide it into four piles, keeping only one pile in front of players for now. From a separate deck, each player is given two differently colored wager cards at the start of play. A bank of 36 coins is divided equally among the players. On a turn, you can either reveal the top card from the current pile (adding it to the display) or auction the cards on display. In the auction, you must raise or pass, and once only a single person remains in the auction, they pay the amount bid to the center of the table, then take any cards that they want to play and start or add to expeditions. Placing the same number in an expedition is okay. The auction winner can also place one card from the display in the box out of play. The auction winner ends their turn by adding a card to the display. When the final card of a pile is revealed, divide all the coins in the center of the table equally among all players, then bring in a new pile to continue play. Once the final card of the final pile is revealed, the game ends immediately with no distribution of coins. For each expedition, a player scores the number of footprints on the numbered cards. If they have a wager in that color, they double that value; if two wagers, they triple it; etc. A player also scores 1 point for each gold coin they hold and 8 points for each expedition that contains at least four number cards. Whoever has the highest total wins!